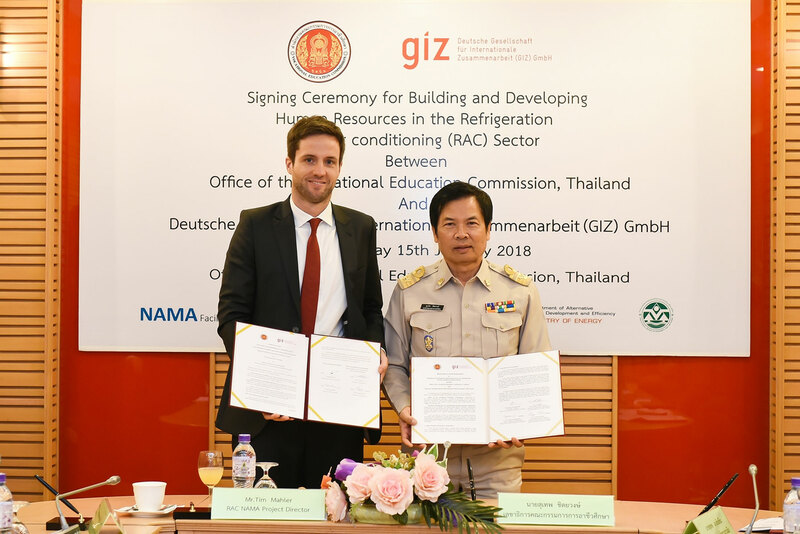 The Office of the Vocational Education Commission (OVEC) and GIZ have signed a Memorandum of Understanding (MoU) on a collaborative programme for “Capacity Building and Skills Development for the Labour Force in the Refrigeration and Air Conditioning (RAC) Sector” under the Thailand Refrigeration and Air Conditioning Nationally Appropriate Mitigation Actions (RAC NAMA) project. Under the agreement, teachers and trainers from vocational education institutes under OVEC will be provided with intensive training by international experts in climate-friendly and energy-efficient cooling technologies based on natural refrigerants. “After their training, we fully expect the master trainers to be equipped with knowledge, skills, and expertise in innovative energy-efficient and climate-friendly RAC technologies, which they will then transmit to the students at their respective institutions. This cooperation will thus ultimately lead to the production of highly qualified manpower to meet the labour market needs and be an important element in the development of the country in the future,” Dr. Suthep added.